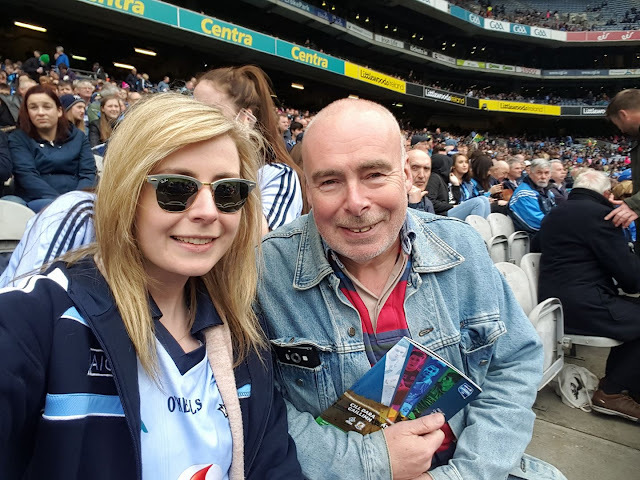 It was a real treat to be in Croke Park today with my daughter Kate to see the Allianz League Final between Dublin and Kerry along with 53,000+ GAA fans. In a thrilling game Dublin’s four-year reign as Division 1 football champions and their 36-game unbeaten streak was ended in dramatic style. The manner of Kerry's victory was spoiled a bit at the end for me as Dean Rock missed a free from long range after Anthony Maher's cynical pull down on a Dublin player. He knew what he was doing and committed the foul a long way from goal. Nevertheless Kerry deserved their victory with some fantastic football reminiscent of Kerry teams of old. We were treated to a tough close game with a lot of skill and an exhibition of point scoring, many from long range, by both teams. For me there is a tinge of sadness in that my regular companion to matches in Croke Park hopes to move to Canada for a few years this summer. Kate loves The Dubs and wears her colours proudly - she will miss the big games this summer, and I will miss her too. Today's game certainly whetted the appetite for the Championship this summer. Now that everyone knows that the Dubs are beatable, it's game on for Sam in September!!! A Great Day Out at GAA Headquarters! There's still a bit of farmer in me!